Senator Craig is not getting much GOP smpathy. It looks like the flood gates have opened- It’s only a matter of time now. Republican Senator Norm Coleman (R-MN)and Representative Peter Hoekstra (R-MI)asked Senator Larry Craig to resign today. 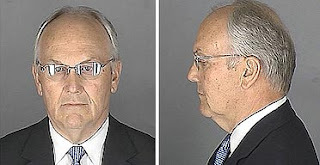 Yesterday, Republican Senators called for an ethics investigation into the Minneapolis airport arrest of Sen. Larry Craig (R-Idaho) over his lewd conduct arrest. The Seattle Times has more on the behavior that got Craig arrested. UPDATE: Senator McCain calls for resignation. UPDATE 2: Craig steps down from Committee assignments. I hear that Democrats are striking their foreheads for not having thought of this sooner. They’re thinking of making it a misdemeanor to be a US Senator or Member of Congress. Then all of the Republicans will be forced to resign. The Democrats, en masse, will announce that they deeply apologize, but that the offense has no bearing on their ability to continue doing the job the American people expect them to do.